The best solution for this type of roof repair is to remove the valley lining and replace it with a suitable liner. Sometimes…actually more than that…I see waterproofing pasted OVER the tiles….This will pretty much make the problem worse. 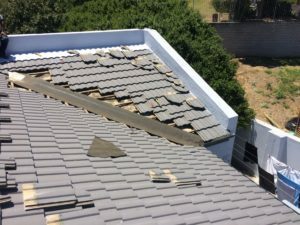 This type of roof repair is quite comprehensive; the tiles need to be unpacked, the liner replaced and then the tiles repacked back into place. A word of caution : Valleys are generally found on higher pitched roofs, which makes working on the roof unsafe. It would be best to find a reputable roofing contractor that can give you a hand with this.